Assume the patient represented in the graph above was infected in the womb or as a small toddler playing in the grass because this is routine. Also assume they have all three infections—Babesia, Lyme and Bartonella. Why? Because it is reality. This unholy triad is common,and the only reason this is not appreciated is due to reliance on limited lab testing such as looking directly for these infections using DNA (PCR) or antibodies (Western Blot). Both methods usually miss all of them. Infections with Babesia, Lyme and Bartonella, which cause fatigue, can come from the womb, a tick bite, a flea bite, flea feces or exposure to common pets such as dogs, cats, rabbits, horses, etc. 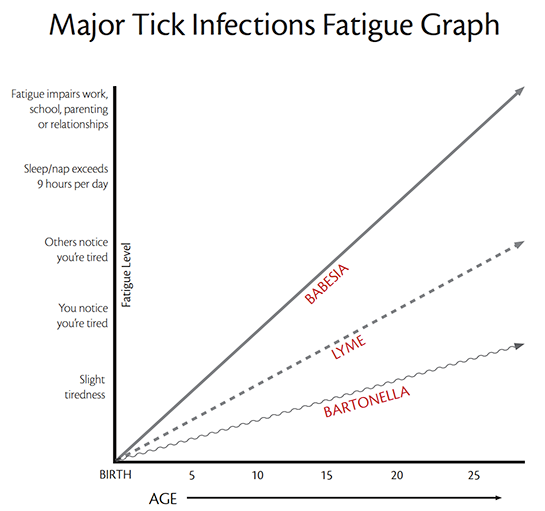 This graph assumes infection onset before the age of one. But people can be infected many times in a lifetime, and, if in different locations, may pick up strains that respond to different treatments. Some children or adults take 5-50 years to become ill from these infections. And some think a new bite or a new trauma is the cause of decreased function when it is actually the trigger revealing a long-term infection that can no longer be controlled. 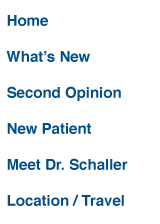 Over 300 things can cause serious medical fatigue according to Dr. Schaller’s full-time clinical research. He is helping people all over the world find solutions to mysterious fatigue. If you have these infections and are treating them, fatigue can be caused by both over-treatment or under-treatment. Both. You can titrate treatment to optimize function. This means that you can have lower dosing to be energetic on work days, and higher dosing to be fatigued on vacation days. For example, a graduate student should be the most aggressive with treatment when they are out of school in the summer.